Well, last night, just before dinner, I decided – in an absent-minded Knight of Swords reversed kinda way – “I will migrate my blog to wordpress.” No biggie, right? Well, that was about 6pm and although the setting up of the new hosting and the repointing of the domain went smoothly (very King of Swords), the actual transfer was a bit of a clusterf*ck. Also, I could not get the new blog to look as nice as the old one. When I went to bed, my eyes were dry with screen-peering and my heart was heavy with blog-snafu doom. I needed some assistance. 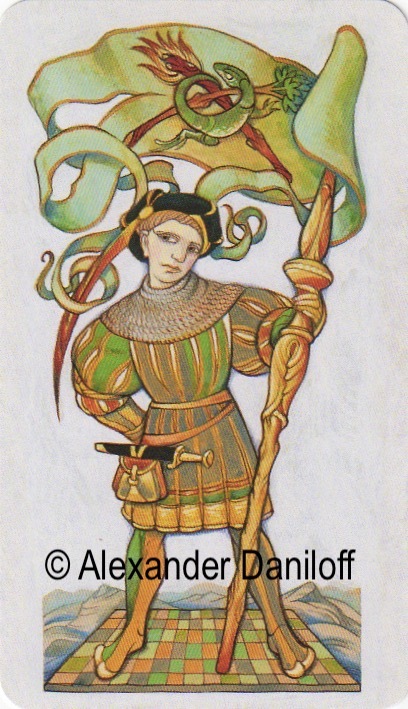 I decided to ask my beloved Court Cards for a little helper today (ie not gin) to get it back on track and I pulled the guy at the top of the post: The Page of Wands from the Daniloff Tarot. The Wands Page brings adventure, courage, action to the table. He is telling me to not be afraid, to go forward with a willingness to try, to see opportunity … and, in this image of the Page of Wands at least, be attentive and LISTEN to what’s out there! Also, maybe wear a hat with nice feather. Awesome! New moon tomorrow Alison so you may need to make a few more tweaks before fully integrating into your new site.